Your guide to selecting and storing produce. Your Guide to Clever Selecting. Having a hard time remembering all those clever fruit and vegetable selection tips when standing in the produce aisle? That's what Harvest, an application for the iPhone and iPod Touch, is all about. Whether it's knocking on watermelons, smelling pineapples, squeezing avocados, or examining the color of peaches, you'll know the best approach. 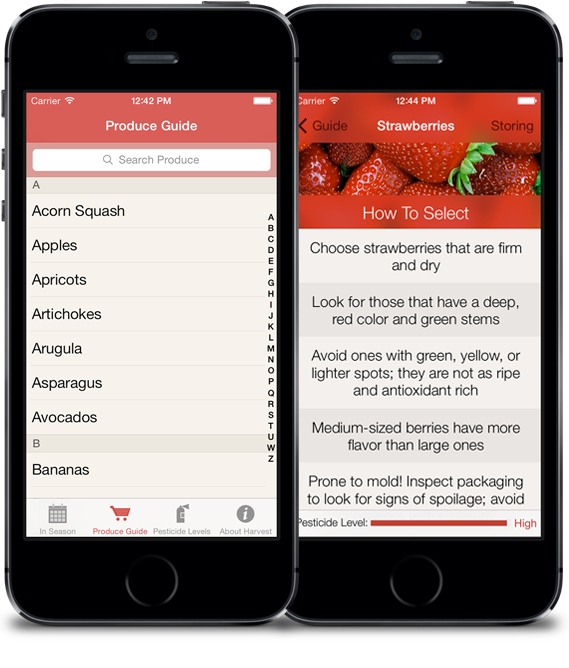 Harvest features an elegant collection of intelligent tips and techniques for over 120 produce items. Harvest was developed with a deep attention to detail and function. With smooth, snappy browsing and searching, it's designed for quick referencing right at the market. Harvest shows produce currently available in your area so you can support regional farms and eat fresh. Your location can be automatically detected for convienent reference. As always with Harvest, no Internet connection is required which is great for stores with poor connectivity. You can also browse seasonal information for any month and location. Currently only the United States is supported but we're working on other countries! Harvest indicates pesticide residue levels for each fruit and vegetable. To watch your budget and chemical exposure, you can selectively buy organic based on which items were shown to have the highest levels of pesticide residue. Furthermore, also included is a full list of pesticide levels from worst to best, so you can see the big picture of how pesticides play out across all produce. You bought it fresh, keep it that way! To complete the process, Harvest offers instructions on how to best store and keep your perfect produce selections. Storing has its own plethora of unobvious tips and tricks. For instance, did you know that garlic is best stored out of the refrigerator, and that fresh corn loses half its sugar content in one day out of refrigeration? Harvest was designed and developed by Sean Murphy. Pesticide residue levels were obtained from the Environmental Working Group. Find out more information about how the results were measured, and why you'd want to reduce exposure.